Have you had amalgam fillings placed in your smile to treat any cavities? While effective enough, patients who undergo this treatment now have noticeable silver spots in their otherwise white teeth, which could result in plummeting self-esteem. Here in Silver Lake and Topeka, our dental team is happy to recommend an alternative – composite resin fillings. This quality mixture is able to restore decayed teeth to a strong and aesthetically pleasing state. 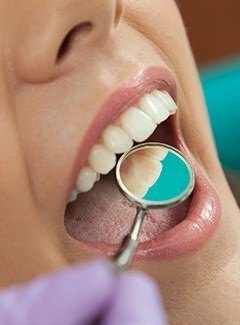 Why Choose Michel Dental for Tooth Colored Fillings? Once your composite filling has been placed, it’s perfectly normal to experience some temporary sensitivity. Also, it’s ideal if patients limit their consumption of foods and liquids that stain due to the possibility that the fillings could become discolored over time. We can place a clear plastic sealant to help prevent this from happening, though. If you’re in need of a filling, don’t wait – contact our team at Michel Dental today!